time pressures, tradeoffs to save money, and the burden of pleasing others make it difficult for mothers to enact the idealized vision of home-cooked meals advocated by foodies and public health officials. Given that the authors (1) don’t share their questioning methodology; (2) offer us only a few choice anecdotes instead of hard data; and (3) have a clear anti-“foodie” agenda, I have no choice but to be skeptical of their sweeping conclusions about women’s dislike of cooking. In 2012 the fast food industry spent $4.6 billion to advertise mostly unhealthy products, and children and teens remained key audiences for that advertising. 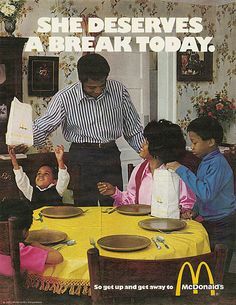 So in addition to all the obstacles the NC State sociologists mentioned, parents who cook are also up against marketers who take advantage of children’s developmental vulnerabilities to create a desire for fast food over home-cooked family dinners. This issue was driven home for me a few years ago when I was cooking dinner and my youngest asked to go to Chick-Fil-A because their mascot had visited her Kindergarten classroom. He put a sticker on her backpack to remind her about the fast food fundraiser taking place that evening. Training young taste buds is difficult enough without adding this kind of pressure to the mix. That’s also why CEO Don Thompson has taken heat for McDonald’s using schools as ads. 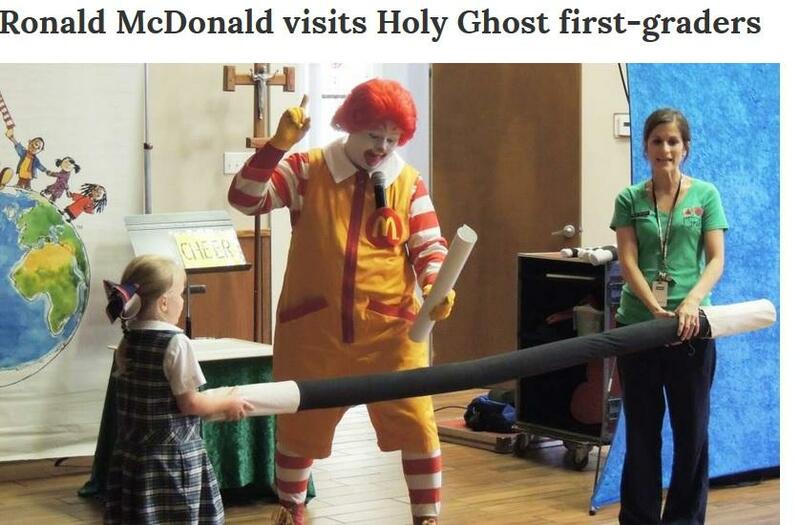 He claims “We don’t put Ronald out in schools” but just this week Ronald McDonald was photographed at yet another school. As someone who values the role of home-cooked meals in teaching my kids to learn to love food that loves them back, I don’t appreciate fast food marketers working to undermine me by targeting my kids behind my back. Want to help lift the burden on parents trying to feed kids home-cooked meals? Let’s turn down the volume on the fast food marketing which adds yet another obstacle to an already difficult task. Please sign and share this letter to McDonald’s letting them know their clown doesn’t belong in schools. Tags: Chick-fil-a, fast food marketing, mcdonald's. Bookmark the permalink.